Below is a list of our certified drop off locations. Call (401)580-7882 for more information. *These locations are not R2 Certified ORS locations. Click Here to Visit Cartridge World, our recycling partner. 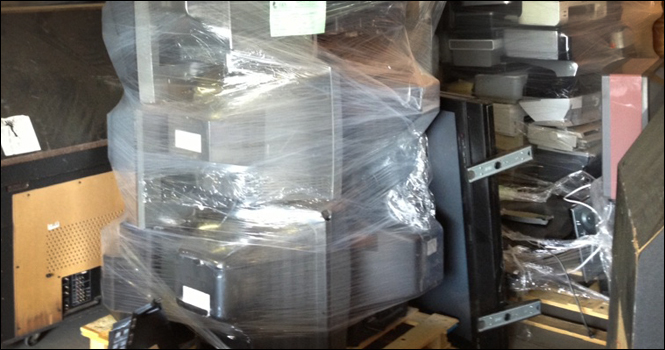 Most people do not realize that old electronic items are technically “hazardous waste“. Computer monitors have lead while there is mercury in some items. There are also a lot of precious metals that can be recaptured and broken down and resold. Some of the monitors will be in good working condition and can be resold. There’s a certain monetary value and a certain environmental value. We definitely don’t want any of the toxins released into the atmosphere, as with mercury, or the water with lead. So when it’s time to dispose of the electronic waste, it should not get tossed into the company dumpster or the household trash. Recycling with ORS will keep electronics out of the regular trash, cut organizations’ and communities’ dumping costs and help the environment. Current figures compiled by the U.S. Environmental Protection Agency indicate that more than 2 million tons of electronic waste winds up in landfills each year. Only 10% of discarded e-waste is currently recycled, so talk to ORS today! Copyright 2013-2016 Office Recycling Solutions. All Rights Reserved.